If you’ve never gotten to check out the Retronauts comic on 1Up’s retro blog, now’s the time for any Sega Addict to pop the cherry. 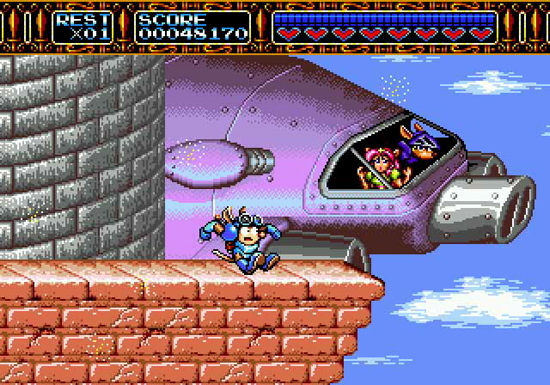 Their latest installment in the series is all about Rocket Knight Adventures, and it’s really damn good. The comic does a great job of balancing hilarity and cartoon goodness with some really informative stuff about the game (for example, the designer for RKA also did Contra: Hard Corps and Contra: Shattered Soldier), and even gives a little science tidbit on Possums at the very end. I never realized that my second favorite Genesis game had garnered such adoration. When the new game was announced, it seemed like all of these fans came out of the woodwork to celebrate what I always thought was an underappreciated game. I am so happy to see that I was dead wrong.